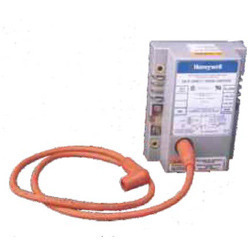 Compact flame switches with built in spark generator (Ignition Transformer).Used with ionization rods/unirod.Operates on a 24 Vac power supply.Switches on valve ignites spark, reattempts ignition in case of flame failure.Optional 30 seconds, Pre purging time. Ignition Modules are an integral part of the engine management. This consists of a minimum, the Hall or momentum donors, the ignition module, the ignition coil and spark plugs. In case of errors with the ignition module, misfires, "stuttering" of the engine or a total failure may occure. In these cases, they must be swapped. A repair is usually not possible because the parts to complex. An Integrated Capacitor Discharge / Transitorised Electronic Ignition module with Flywheel gets rid of the conventional Contact Breaker point systems.